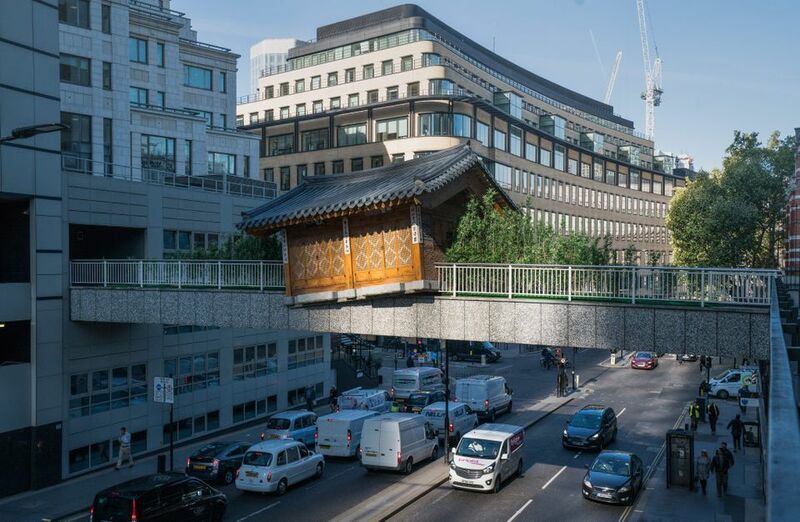 Korean artist Do Ho Suh’s replica of a Korean house and surrounding bamboo garden (Bridging Home, London), installed on a footbridge at Wormwood Street in central London, will remain in situ for another 16 months. The sculptural installation, curated by the director of Draf, Fatos Ustek, will remain in place near Liverpool Street Station until March 2020 after the non-profit organisations behind the piece—Art Night and Sculpture in the City—submitted an application to extend planning permission. The fourth edition of Art Night, a free contemporary art festival, is due to take place next June in Walthamstow, north east London, and the central district of King’s Cross. “Art Night 2019 will centre on the first London borough of culture, Waltham Forest,” a project statement says, referencing Mayor Sadiq Khan’s new arts initiative focused on specific neighbourhoods. Art Night’s new artistic director, Helen Nisbet, will oversee the next two editions. Do Ho Suh is also making his presence felt in New York. A full-scale fabric replica of the artist’s former New York City apartment, The Perfect Home II (2003), is on show in the rotunda of the Brooklyn Museum (until 27 January). The piece was donated to the museum by the New York-based businessman Lawrence Benenson.